Below is basic information on bail bond laws for Wisconsin concerning Bail Enforcement, Bounty Hunters, Fugitive Apprehension and Bail Bondsman. This is not legal advice. Laws change frequently, please check the links provided for possible updates and current information. (1) Every surety under this chapter, except a surety under s. 345.61, shall be a resident of the state. (2) A surety under this chapter shall be a natural person, except a surety under s. 345.61. No surety under this chapter may be compensated for acting as such a surety. (3) A court may require a surety to justify by sworn affidavit that the surety is worth the amount specified in the bond exclusive of property exempt from execution. The surety shall provide such evidence of financial responsibility as the judge requires. The court may at any time examine the sufficiency of the bail in such manner as it deems proper, and in all cases the state may challenge the sufficiency of the surety. Wisconsin does not permit commercial bail bonds therefore, only law enforcement offers within the state can arrest or detain individuals. Others, must get a warrant for the arrest. 969.14 – Surrender of principal by surety. (1) When the sureties desire to be discharged from the obligations of their bond, they may arrest the principal and deliver the principal to the sheriff of the county in which the action against the principal is pending. (2) The sureties shall, at the time of surrendering the principal, deliver to the sheriff a certified copy of the original warrant and of the order admitting the principal to bail and of the bond thereon; such delivery of these documents shall be sufficient authority for the sheriff to receive and retain the principal until the principal is otherwise bailed or discharged. (3) Upon the delivery of the principal as provided herein, the sureties may apply to the court for an order discharging them from liability as sureties; and upon satisfactory proof being made that this section has been complied with the court shall make an order discharging them from liability. Bond agents from other states seeking to arrest a fugitive who has fled to Wisconsin must get a warrant, then have law enforcement make the arrest. 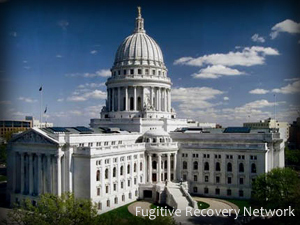 You must work within the law, in Wisconsin there is no state permitted bounty hunters – however, this does not prevent a someone from locating a fugitive, have local law enforcement arrest the fugitive, then get the proper papers to prove that the fugitive is detained. Please check with the Wisconsin’s Department of Insurance, Licensing Board and/or Local Law Enforcement for the most recent updates. If you know of any updates to Wisconsin’s bail bond laws, please provide as much detail as possible and send to us using our contact form.